Published August 15, 2015 By Anna T. This post may contain affiliate links. Regardless, I only recommend sites I've researched and/or used and trust. 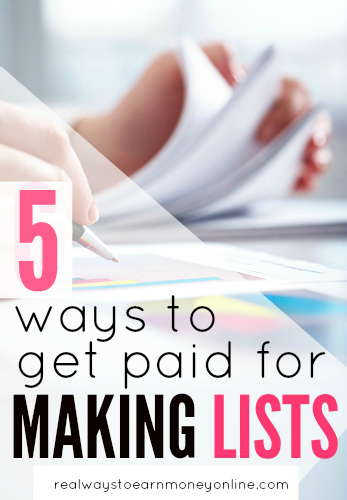 This is one of the highest-paying and most known sites that will pay you to make lists. You can earn $100 for an accepted list. The list must be at least 1500 words with a minimum of ten items on your list. Listverse will also link to your blog, Twitter, or an eBook you want to promote if you have it. Go here to read our full review of Listverse. Cracked accepts lists as well as other types of content, but it says plainly on their website that the list-style articles are always some of their most popular. They make no secret about being extremely picky when it comes to what they choose to publish, but the pay is great if you're lucky enough to get your content published. Cracked is not a site we've reviewed for writers (although we probably should), but I did find some great info here on Reddit about how the process of writing for them works. You can submit lists of at least 10 items, containing at least 800 words, to this site. Each list can include your byline. Payments are via Paypal or Payoneer. This site publishes lists on many different topics. You earn money via ads (Google Adsense) that are placed on your published articles. The owners of the site take 50 percent of this revenue, and you get the other 50 percent. You can use affiliate links in your content (Amazon and Commission Junction) and earn 100 percent of that revenue. What Culture is based in the UK, but it appears they will accept list-style articles from anyone regardless of country. They promise to pay £0.40 per every 1,000 views your article receives, which is around .60 USD if the calculator I used to convert was correct. Pays is made via Paypal. They publish articles across a variety of different categories, including film, sports, and gaming, and they want you to share your published posts on social media. Do you know of any other websites that pay people for submitting lists? Please comment below and share it if you do, and also please let us know if you've ever written lists for any of the above sites. Good luck to anyone who gives these sites a try! This is the most profitable route to take as a freelance writer. You can get your own clients and set your own rates, which you cannot really do with sites like those above. A six-figure income is not outside the realm of possibility when you're running your own business. Top tenz is no longer accepting submissions. I just wanted to let you know about History Lists. As of September 1, 2015 they won’t accept new submissions due to the influx of current submissions. If it’s still there when you read this, it is in a yellow box at the top. Can you normally use a pen name when you submit articles? It will depend on the site, but I’m sure in most cases that’s fine. I’m a history buff, so maybe that will finally pay off for me at history lists. I’m already excited thinking about all the lists I could make just pertaining to George Washington. Thanks Danielle, have added it.